The Den-Con UC and SCB Casing Bushings are installed directly into the rotary table and allow casing string to be rotated during cementing operations. The casing string is aligned with the center of the hole while the string is being run. The UC Bushing is a solid body design for 17 1/2” to 27 1/2” Rotary Tables and will accommodate up to 20” tubular goods. The UC Bushing is equivalent to the Varco CU Bushing. The SCB Bushing is a split body designed to fit directly into 49 1/2” to 22” Rotary Tables. 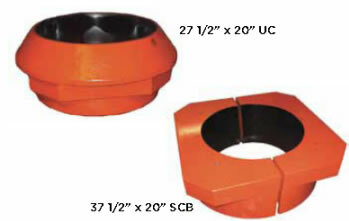 All Den-Con UC and SCB casing bushing are rated 500 ton and are 4 taper.